The Partition of India: Jinnah: "I don't regard myself as an Indian"
Jinnah: "I don't regard myself as an Indian"
In an interview of Jinnah by Norman Cliff, published in the News Chronicle(London) of March 30, 1946, Jinnah declared "I don't regard myself as an Indian". This was just after the Cabinet Mission arrived in India, and just before they arrived at Delhi to start conferring with Indian leaders. This interview was mentioned in the Times of India a couple of days later, and so was known in India. With respect to Ayesha Jalal's thesis that Jinnah never intended the existence of an independent Pakistan, I suppose Jinnah's regarding himself not as an Indian was also merely a negotiating ploy. 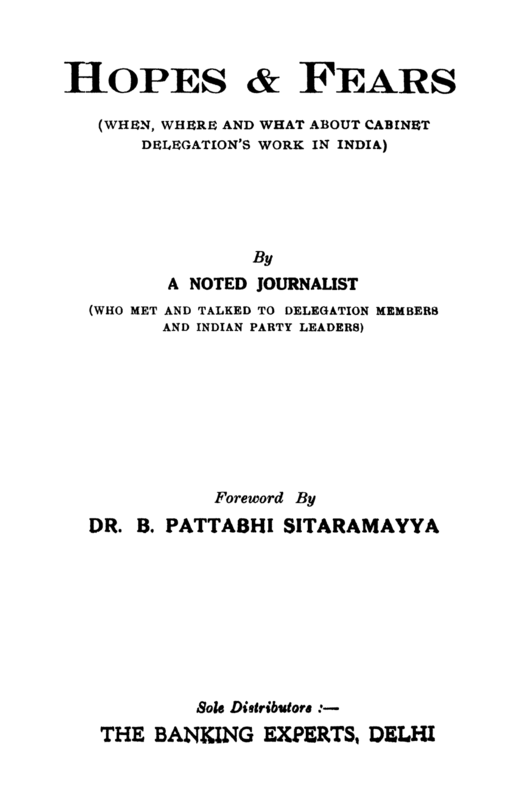 "Hopes & Fears (When, Where and What About Cabinet Delegation's Work in India)", is a contemporary account, in diary form, of the Cabinet Mission by a journalist who chose to remain anonymous. 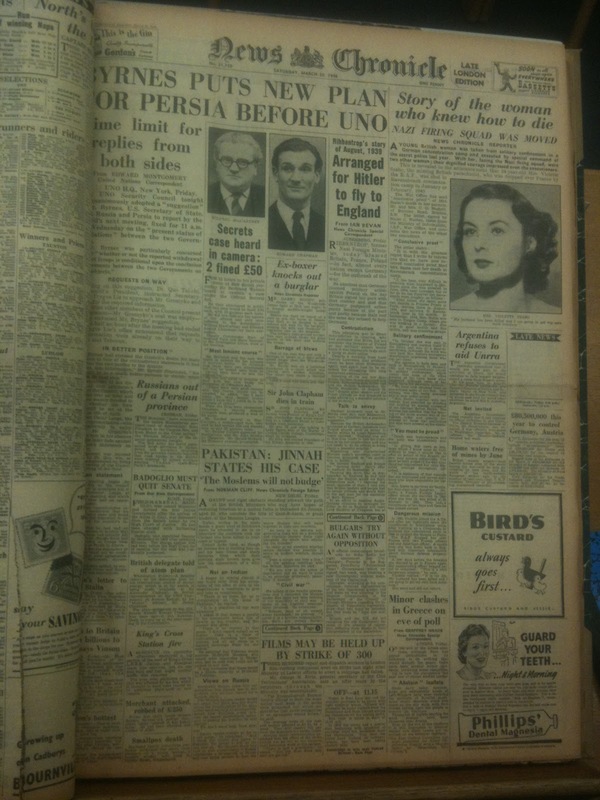 It was published around June-July 1946. (click on images for larger size). 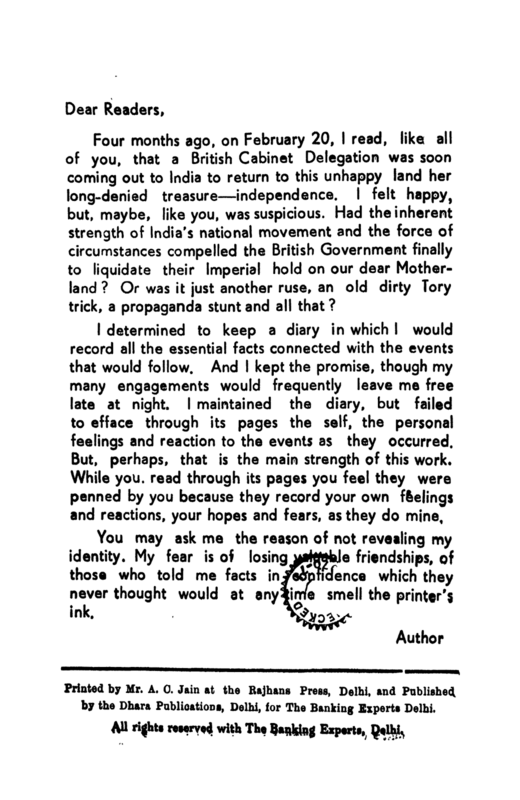 The Times of India today has featured an interview given by Mr. Jinnah to Norman Cliffe, Foreign Editor of the News Chronicle in Delhi, in which the League Fuehrer confessed he did not consider himself to be an Indian. What nonsense. Why not then quit India? India is for Indians only. 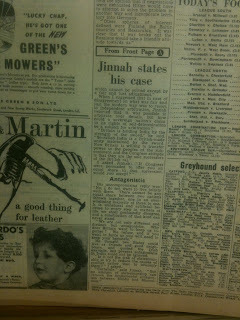 Norman Cliffe's dispatch to his paper also contained the following sentences which were omitted by the Times of India !—"A gaunt and rigid obstacle standing athwart the path of the British Ministers who have hopes of restoring freedom to a united India, Mohammad Ali Jinnah, aged 70, who assumes the title of Qaid-e Azam or great leader of the Muslim League. In his study beside a great bowl of full blown roses he revealed to me the stubborn rock the Cabinet trio have either to overcome or bypass". Various chronologies on the web, obviously copied from a source that I couldn't find, did mention the interview. Google Books didn't help getting the text of the interview. March 30. In a meeting with Cripps, reiterated his firmness on Pakistan but agreed to meet Mohandas Karamchand Gandhi (Mahatma) for mutual agreement, said that, "it was most desirable that antagonism and public vituperation should cease and all parties concentrate in friendliness to try and get an agreed settlement. 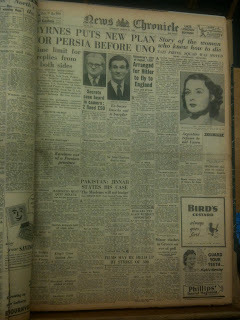 Interviewed by Norman Cliff, Foreign Editor, News Chronicle (London). As per the timeline, March 29-April 1, Jinnah presided over the All India Muslim League Working Committee meetings, which authorized him to represent the AIML to the Cabinet Delegation. Finally we had to resort to the Library of Congress. This may actually be material not published anywhere else, to be added to Jinnah-iana. A GAUNT and rigid obstacle standing athwart the path of the British Ministers who may have hopes of restoring freedom to a united India is Mohamed Ali Jinnah, aged 50 [sic] who assumes the title of Qaid-E-Azam or great leader, of the Moslem League. Today, sitting in his study beside a great bowl of full-blown roses, he revealed to me in an interview the stubborn rock the Cabinet trio have either to overcome or bypass. Jinnah looks tired as though an intense fire is burning him up, and his lean frame and sharp features, from which flash piercing dark brown eyes, give him the appearance of a wiry hawk. I began by asking Jinnah if one could infer from his acceptance of the offer to join in negotiations a readiness to give and take or compromise. "There is no room for us to compromise on the issue of Pakistan", he replied. "It is a question of our very existence." "There is not country in that sense. I don't regard myself as an Indian. India is a State of nationalities, including two major nations, and all we claim is a distinct, sovereign State for our nation." He admitted that Pakistan would exclude 25,000,000 Moslems who would form minorities in Hindustan, but he said they could not be helped in any case. It was fortunate that there would be a Hindu minority of 25,000,000 in Pakistan. Inevitably Russia came into our discussion, but Jinnah saw in this problem only another reason for a Moslem State. "We don't want help from anyone." "Russia means trouble as far as I can judge," he remarked. "And I think the sooner you agree to Pakistan the better it will be for you and us. No Moslem State can look on with complacency if Russia establishes a stronghold in Persia and one thing certain is that the entire Moslem bloc will stand together in their own interests. "As soon as we become self-governing there will be a powerful and friendly Moslem State right alongside the whole bloc adjoining the frontier." "Even a mouse can free a lion." "We are now in the arena of negotiation and we want to come to an amicable settlement, peacefully if possible." "Nobody, least of all myself, wants bloodshed," he averred. "I agree it is a terrible responsibility, but there are certain matters which cannot be solved except by a fair and just adjustment." 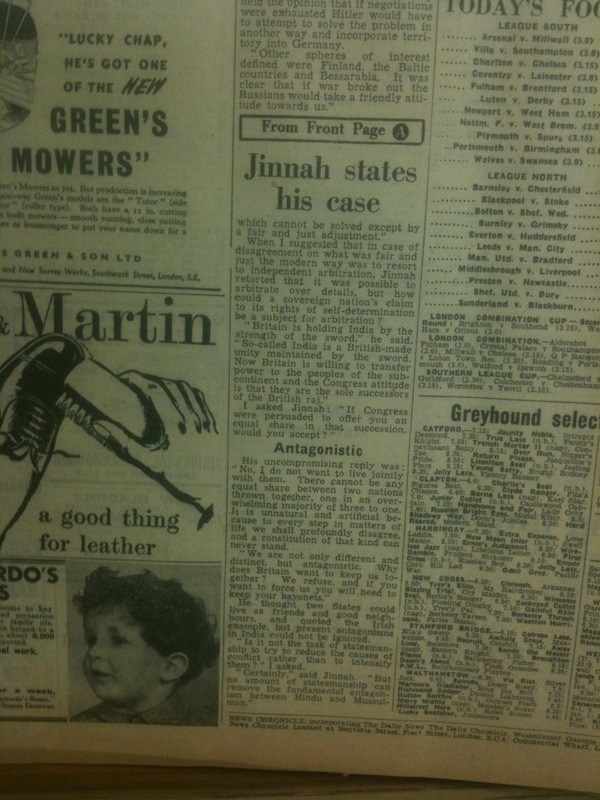 When I suggested that in case of disagreement on what was fair and just the modern way was to resort to independent arbitration, Jinnah retorted that it was possible to arbitrate over details, but how could a sovereign nation's claim to its rights of self-determination be a subject for arbitration? "Britain is holding India by the strength of the sword," he said. "So-called India is a British-made unity maintained by the sword. Now Britain is willing to transfer power to the peoples of the sub-continent and the Congress attitude is that they are the sole successors of the British raj." I asked Jinnah: "If Congress were persuaded to offer you an equal share in that succession, would you accept?" His uncompromising reply was: "No, I do not want to live jointly with them. There cannot be any equal share between two nations thrown together, one in an overwhelming majority of three to one. It is unnatural and artificial because to every step in matters of life, we shall profoundly disagree, and a constitution of that kind can never stand. "We are not only different and distinct, but antagonistic. Why does Britain want to keep us together? We refuse, and if you want to force us you will need to keep your bayonets." He thought two States could live as friends and good neighbours, and quoted the Irish example, but present antagonisms in India could not be ignored. "Is it not the task of statesmanship to try to reduce the causes of conflict rather than intensify them?" I asked. "Certainly," said Jinnah. "But no amount of statesmanship can remove the fundamental antagonism between Hindu and Mussulman." Excerpt: Transfer of Power, Volume VII, item 46, page 113. Record of Meeting between Cabinet Delegation, Field Marshal Viscount Wavell and Maulana Azad on Wednesday, 3 April 1946 at 10 AM. [The Secretary of State asked] Was it the intention that Muslims in Hindustan should be regarded as aliens. Dr. Azad said that the position was quite clear. If Mr. Jinnah insisted on two sovereign States and the two nation theory and claimed the Muslims left in Hindu India as nationals of Pakistan, they would become aliens in Hindustan. Sir S. Cripps said that as a legal conception this was impossible. Muslims who had been domiciled for generations in Hindustan could not be regarded as citizens of Pakistan. Dr. Azad said that the position which Mr. Jinnah had adopted was fundamentally untenable because he insisted that the Muslims were a separate nation and had recently said that he was not an Indian. Unless he gives up this theory it was inescapable that the Muslim in Hindustan should have an alien status. I salute Jinnah for taking away garbage from India so India can now progress. India is the fastest developing big economy today leaving Pakistan far behind.